Retro Game Challenge is rather difficult to describe to the uninitiated, despite the fact that the overall concept is deliberately simple. Its creation is the result of Game Center CX, a popular Japanese TV program in which comedian Shinya Arino is forced to play old Famicom games until he either beats them, or the day ends. 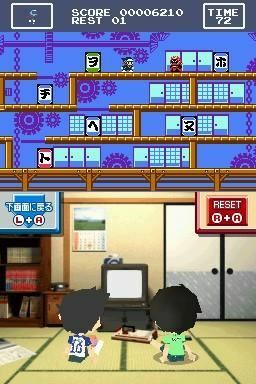 Coupled with a variety of other game-related features and the interaction between Arino and his crew, the show is said to be incredibly funny (while also being a nostalgic look at the ever loved Famicom era). 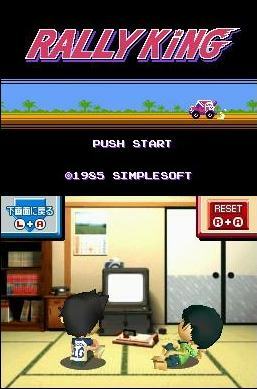 Its popularity spawned a game with its own clever concept: a virtual version of Arino decides to trap you in the 1980’s, where the kid version of you is forced to complete challenges in a variety of games with the help of kid Arino. The twist is that none of them are “real” Famicom games, but instead are new retro styled games meant to parody and champion a variety of classic titles from the era. 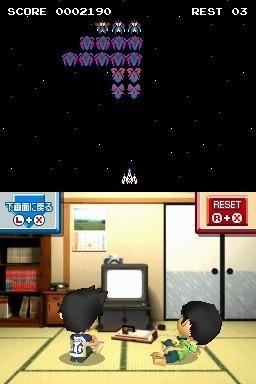 Game Center CX was recently localized by XSEED with the name “Retro Game Challenge,” and now you to have the chance to play some brand new 8-bit games on your DS. If you are like me, that isn’t an opportunity to turn down. It is important to recognize that RGC is not merely a collection of old style games. It wishes to recreate the experience of playing games during the 1980’s. And so there are visual nods abound, from the 80’s styled basement you play in, to the retro-styled Gamefan magazine that you can read for all sorts of tips, tricks and information. If you experienced gaming at all in the 1980’s you will find something in RGC that hits home. Maybe it is the way that your child avatar crawls over to the shelf of games, or the way Little Arino praises and taunts your play. Perhaps it is scratchpad that you can write notes on, or the way Mrs. Arino yells at you for playing too long. RGC does a fine job at capturing the excitement and hope that gamers had as their hobby moved from the arcades and into the living room. At the same time, it also foreshadows the industry’s eventual reliance on sequels and the market over-saturation that plauged the NES/Famicom era. Talking to little Arino will likely remind you of your own self as a child, and it is fascinating to look back at this era knowing all that we do these days. Of course, all these cute touches do little if the available games cannot work their magic. Thankfully this is not a concern. 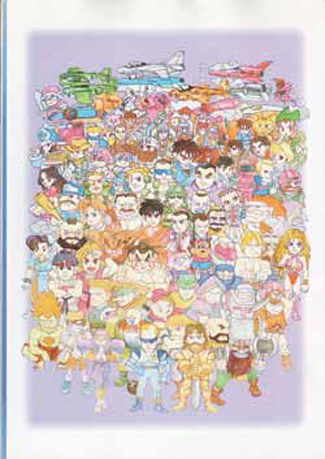 Each game is built in order to represent the levels of graphical and sonic quality present during different parts of the 8 bit era, and the depth and feature lists of each game grow as well. RGC explores early arcade ports, role playing games, and the gradual increase in complexity among platformers and action games. Many of the games are also based heavily on real franchises (RPG Guadia Quest, for example, takes many pages from Dragon Quest 2). Everything feels and plays “right”, with the exception of difficulty. The games capture the brevity of most NES games without all of the soul crushing challenge, though some may argue that we have gotten better as players, and thus can discover the tricks and exploits right off the bat. While possible, this flies in the face of the common belief that we were somehow able to accomplish much greater gaming feats in our youth but would struggle with the same tasks today. In any case, while none of the games are a walk in the park to finish, most of them should not take more than a few sittings to beat. Keep in mind that it is only at the very end that Arino’s challenges involve playing through each game to the end, so the lax difficulty also ensures that you should not be stuck on any one challenge for too long. Unfortunately, no matter how “right” Retro Game Challenge feels, the very nature of the game ensures that certain difficulties will arise. Most obvious is that this is one of the toughest localizations any company could choose to tackle. While it may not be known to every gamer, the Famicom era was a different beast from the Nintendo era, even though they occurred simultaneously and shared many experiences. The original game – Game Center CX – is entirely steeped in Japan’s nostalgia for the Famicom, a love which is unlike any other in gaming history. While Retro Game Challenge’s localization can translate some of this into an analogous Western trend, it cannot capture everything. The shape of the console, its cartridges, and its instruction manuals are all based on the Famicom, and while the Gamefan issues now read like a ditzy old copy of Gamepro, it perhaps shares more in common visually with Famitsu. This may technically diminish the overall experience, but without playing (and understanding) the original, it is tough to know just how much it has changed. Based on what I can actually experience, RGC does an admirable job in its translation, and I get the feeling that XSEED understood that anyone who cares enough about retro gaming to play and enjoy this title knows enough (or is willing to learn) about the Famicom in order to understand the rest. Another area of potential suffering comes from the fact that RGC is so serious about its mission that its games “unlock” the same way we played them back in the day; if we were not done with a game our parents would not buy us another. The only way to earn a new game is to beat all four of Arino’s challenges in the current one, after which little Arino will arrive with a fresh addition to his library (which, according to the chronological progression of Gamefans on his shelf, suggests that he only gets new games a few times a year). This means that if you do happen to get stuck on one, your progress will come to a grinding halt. Even if you do not struggle, you will have to get through games you may not particularly like. I have found that the most common example is racing game Rally King, which has simple but tricky drift controls you will need to master. On one hand, being forced to slog through the lesser games in order to get to what you want to play is an unnecessary chore that modern games can (and should) avoid. On the other, this approach is not the result of the developers being ignorant, but is a deliberate choice that is in line with the style of the game. This then leads to an even more crucial question – just how good can the game be if not all of the games are worth playing? I thought deeply on this question when replaying the platformer Haggleman. After unlocking the highly improved sequel, I wondered why I should ever bother to replay the original after having finished all its challenges, since it was introduced and made obsolete on the same DS cart. I found my answer later, after unlocking the entire suite of games. While true that some of the games fare better than others, each has something worth exploring. Barebones Galaga clone Cosmic Gate is worth completing if for nothing more than to assure your gaming skills, while Haggleman 1 actually plays better than its sequel because of its simplicity and compact levels. As for Rally King, I quickly adjusted to its controls, and found it and its sequel to be two of the best games in the collection. My issue with Retro Game Challenge is not due to poor construction, but its mission statement. No matter how much I feel that a true retro gamer should be able to at least grasp all these games (Rally King included), I cannot deny that people will always dislike certain genres, a problem which cannot be avoided in a game that wishes to explore an entire console era. It is also impossible to avoid the fact that many elements of 8-bit games have not aged well, and so an old school RPG like Guadia Quest is more interesting from a historical standpoint than it is genuinely fun. Lastly, there is only so much one can do in a first release, and I found that RGC had to sacrifice variety in order to make its point. Out of the eight games offered, three are based on Haggleman and two on Rally King. Out of the remaining three, two are vertical shooters. To be fair, these are gross generalizations (Haggleman 3 is nothing like the other two), and my original point was that this approach was necessary in order to chronicle both the nature and scope of sequels during the era, but it is the type of tradeoff that is frustrating when you know that no matter how good everything is, there is so much more missing. Retro Game Challenge is almost impossible to reccommend to anyone outside of a very specific type of gamer in a very specific age group. However, those who fall into this subset will find a game that is tailor made to cater to their sensibilities. They are likely to understand the unavoidability of many of its flaws, and will appreciate some of them for capturing the nature of the era. It is hard to deny that RGC is a bold project with even greater future potential. If you are a reader of this site, there is a better chance than not that this will be right up your alley, so do the right thing and give it a shot so that we may one day see the rest of the retro game world explored. That show and the game are freakin’ awesome. I have a bunch of fansubbed episodes of it sitting around on a hard drive somewhere. I really liked the option of looking up stuff in the gaming magazine and using the info in the games. It made me feel like I was nine again.